Measuring the Return on Investment for SEO? To you, SEO may mean creating great content, having great information that you’re sharing and yet, you may have very little visitors come to your website. Have you ever wondered if your SEO efforts are working? For most, SEO is no easy task. And, when it comes to measuring the actual return on investment most business owners are unable to calculate it. By the end of this article, you should have an idea on how to measure the ROI for the amount of SEO that you’re doing for your business. The goal is to use 7 unique attributes to validate whether or not SEO is working for you. Let’s begin. 1 – Are you seeing an increase in non-branded traffic? Having an increase in organic traffic in general is a good sign. And, typically, you want to make sure that you are capitalizing on non-branded search terms to make the most out of SEO. One key element in this is to make sure that you’re ranking for search terms that don’t require you to have your brand in front of it. Assuming that you are a small business who specializes in the greatest Pot Pies in the city of Detroit. You want people to search for “Pot Pies” where generally, you would rank organically in that search phrase. Therefore, having visitors click through your search result and ultimately landing on your website. Great, but how do we verify this? 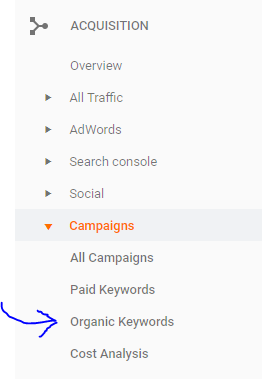 To analyze the non-branded keywords properly, it’s important to separate them by going to the advanced settings. In there, you will have to option to “exclude” your brand mention or name. This will help you identify what types of non-branded organic traffic you are getting. One key point to remember for using these metrics is to identify new visitors who are generally unfamiliar with your brand or business. To make the most out of this process and to ensure that you’re monitoring it regularly, make sure that you create a custom report that is emailed to you regularly. 2 – Are there increased Inbound Links to your Website? For years, the core of SEO has always been about building backlinks. Ultimately, over time, Google decided to filter the types of links it deems as worth considering in the Search Engine Ranking factors. This had tremendous effects on millions of websites either on a negative and positive way. It’s important to know on how to analyze the links that are pointing back to your website. There are a variety of ways to do this. And, to me, based on a series of factors – my most recommended resource to analyze links is AHREFS. AHREFS is a great resource to analyze the links pointing to your site. 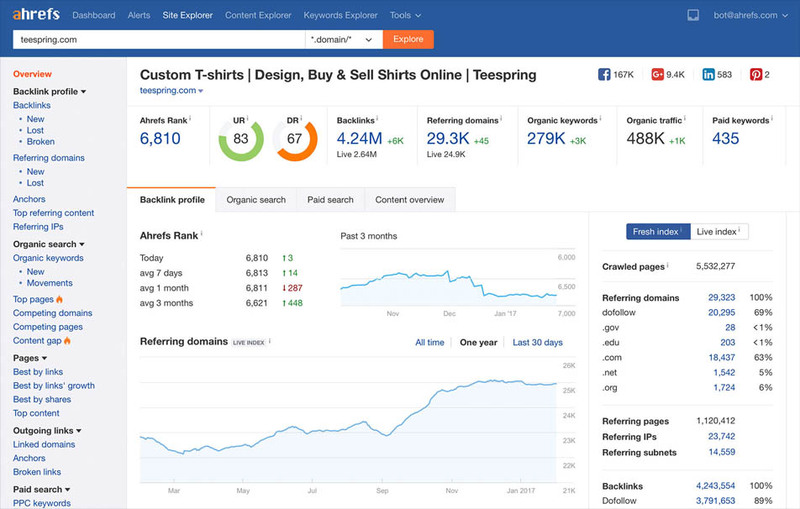 And, the great thing about AHREFS is that there are functions to be able to analyze your competitors best ranking keywords as well. We’ll save on how to do that for another time. 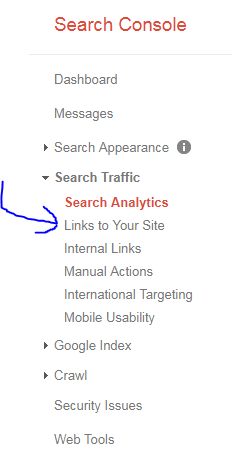 Once you open up the “Links to Your Site” section, you will be able to view how your are referenced when it comes to the links pointing back to your website. Although not as comprehensive as AHREFS, Google Search Console acts as a good reference to verify the amount of inbound links you have out there. 3 – Are you obtaining High Quality Traffic from the Search Engines? One factor that always helps determine if SEO is working is to see a spike in traffic. Business owners typically feel that just by having an increase in traffic means that their SEO efforts are paying off. If you are getting hundreds of even thousands of visitors, but aren’t seeing any real increase in Sales or Conversions, then you’re probably not getting quality traffic. In short, it may mean that you are ranking for keywords that are too vague or don’t have much conversion associated with them. This is where you have to be cautious and analytical at the same time. For instance, an increase in bounce rate typically doesn’t look like a good place to be. And, if you’re noticing that the session duration is historically lower on average, you may want to adjust certain things to help improve the quality of traffic that you’re getting to your site. You’re also able to analyze how deep your customers are going. Meaning, by clicking on “Page Depth,” you’ll be able to see how many pages your traffic is checking on average. This is a great way to analyze engagement and to give you insights on what to improve on. 4 – Have you set up your Goals on Google Analytics? Measuring goals is a great way to get the most out of Google Analytics. And, most importantly, it gives you an indication on how well your traffic is engaging with your content or website. Ideally, you want to increase the amount of conversions that are happening on your site. These conversions may come in a variety of different forms. This feature will allow you to analyze and monitor specific targets that you would want accomplished on your website as Goals. Setting up Goals in Google Analytics is a great way to measure direct correlation with the type of traffic that you are getting. If you want to make the most out of your SEO efforts and want to verify its effectiveness, Goals are a must. Also, keep in mind that you can add a series of Goals depending on your aim and objective for your business based on different times. 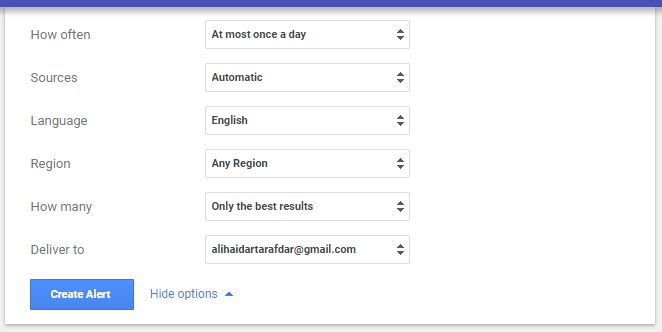 5 – Have you created Alerts using Google Alerts? This process is probably one of the most overlooked steps when it comes to measuring the ROI for your SEO Campaigns. Those are some basic functions of what Google Alerts can do for you. To make the most of it, the best thing would be to use the list above and create alerts for each one. it’s as simple as typing in the exact word or phrase that you would like to be notified for each time there is a new post that is published. You can chose how often you would like to receive the updates. The best is if you do it based on “as it happens.” This way – you will be able to get live updates and be able to act on it – instead of waiting. Alternatively, if you decide to do it once a day, if there are no updates, you will not be notified. And, you are able to chose the type of results you want. You can identify which sources you want to be notified from, such as video, images, news, etc. One tip is that make sure you chose the option of “all results” where it says “How many.” You don’t want to miss anything that’s important and relevant to your criteria based on the alert. 6 – Are you up to speed in terms of your Competitors and their SEO Strategies? Often, business owners think that just focusing on your own SEO strategy and building content is sufficient. When you are competing for Search Results in order to rank, you have to out-compete those other websites that are on the first page of Google. Which means that you have to worry about how those specific sites are ranking and what kind of SEO strategies they are using. The greatest advantage of SEMRush is that you are able to deeply analyze several metrics in reference to your competition. Also – you can easily generate competitor reports if you have a plan. Although it is not a free tool, it’s one of the greatest assets that you can have when it comes to your SEO Campaign Execution plan. Remember, this is an essential strategy for you to get the most out of your SEO. When it comes to ROI, you have to take into account what is working out there and of course, what you need to focus on, based on competitive intelligence. 7 – How are your Revenues and Sales being impacted? It all boils down to profit and gains. The end result of any Marketing or SEO Campaign is to generate profits. The obvious ROI when it comes to SEO would be how your sales were impacted. This means looking through all the campaign strategies that you had deployed to tracking everything meticulously. An important point in that is to convert well. If your traffic is not taking action, or your goals are not being achieved based on the way you had set them up on Google Analytics, it’s important that you retool or restructure some of your strategies. In the Digital Marketing niche, a key metric or factor when it comes to conversion may be when a customer sign up to our email list. The reason why we consider this valuable is because that customer to us is considered an Asset. Since we no longer need to worry about exerted efforts such as SEO Campaigns, Paid Ads, Social Media, etc, the customer in our email list is essentially getting our communications internally without outside costs. In the long-run, if that same customer buy a product or service that I offer, it would have been worth it. Even prior to beginning your SEO Campaigns and planning it, it’s important to have a strategy in place that will allow you to measure your successes. My recommendation to you is that you set up a well documented process in how you can achieve this. I also recommend that you save this article for future reference in case you forget some of the steps mentioned here. Remember, SEO is a long-term goal. Which means that you need to concentrate your efforts on getting higher quality traffic and ultimately making them convert well. Ali is the SEO and Content Strategist for Web 247 Solutions. He builds structured platforms for the clients of Web 247 and has extensive experience in Branding, Search Engine Marketing as well as other Business Strategies that effectively help websites grow. Great article, very useful information. I would like to add one interesting way to track the success and ROI of your marketing activities – You can use inbound numbers, like 1300 and 1800 numbers here in Australia ( https://www.iphub.com.au/ ), and through inbound call reports, see who responds to each of your campaigns as well as when, where, and how. I am glad that article was helpful, Thank you for sharing this with us David. Thanks for sharing your deep knowledge about SEO. I’m happy to have found this info on this article and looking to read more blogs from you. Thank you for reading the blog, I am writing more stuff and hopefully I will have a lot more valuable content up regularly.